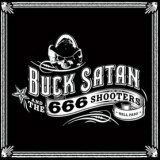 The sort of mash-up that could make sense only in Ministry legend Al Jourgensen's drug-addled mind, Buck Satan and the 666 Shooters isn't actually the first time that someone from a metal background has tried his hand at country (Dimebag's Rebel Meets Rebel and Jeff Walker's silly Welcome to Carcass Cuntry come to mind) but it's one of the more fitting. There's always been a strain of the outlaw in Jourgensen's anti-establishment persona, and the music here takes an upbeat, strident route of drum-machine-backed fiddle-and-harmonica-enhanced country, with lyrics extolling every vice from drinking to cocaine. What surprises is how well it works, the likes of opening track Quicker Than Liquor coming over as catchy country-rock and the following What's Wrong With Me about as heavy as things get, Al's throaty yell atop a melodic country blend. Don't expect any of the industrial thrashings that we heard on the past few Ministry albums; this is far more country than you may at first think. Which is a disappointment at first, but fans of the more leftfield country acts are sure to enjoy the album, Medication Nation earning itself my love as its off-kilter melodic barrage works its way under your skin, topped off by Al at his most wearisome. Drug Store Truck's whimsical clatter and The Only Time I'm Sober Is When You're Gone's heartfelt misery are highlights, as is Cheap Wine Cheap Ramen's anti-music business diatribe. There's no reason that Down The Drain's fiddle-backed gallop won't appeal to fans of folk music, and little touches like announcements of the musician before a (uniformly excellent) solo make it all the more fun. The roster of musicians taking part is worth a look, as a sidepoint, the usual Ministry and Static-X members like Mike Scaccia and Tony Campos present and correct but Cheap Trick's Rick Nielsen is also involved, as are fiddlist Jo Bird and cellist Margaret Lejeune - a lot of effort has gone into making Buck Satan and the 666 Shooters, and it shows in the quality musicianship and even variation in the songwriting, closing ballad Take Me Away especially moving. As far as Ministry side-projects go, I'm usually pretty underwhelmed, but Al has done a untypically professional job, one that I suspect I'll still be enjoying months after his day-job's forthcoming reformation proves a disappointment. The only mistake he made is not including a human drummer, but it's a mistake that's easy to ignore due to the quality of the music overall. A surprise hit.